Colbart divided the vodka (between/among) all his friends. After accidentally shooting his friend in the face, The Vice-President didn’t feel (like/as if) he needed to tell anyone. The vodka bottle fell (off of/off) the table and broke. Has she been (into/in to) see you today? The three stooges walked (into/in to) the broom closet. Errors in using prepositions are common. In the first sentence, if Colbart had just two friends, he would be dividing the vodka between them. Among is usually used for three or more persons or things; between is used for two. In the second sentence, the preposition like cannot introduce the clause he needed to tell anyone. The preposition like can introduce only a noun or a pronoun. It looks like rain. A clause—containing a subject and a verb—must be introduced by as if or as though: It looks as if (not like) it’s going to rain. Note though that this rule doesn’t apply to colloquial English, especially American colloquial English. In the third sentence, of is unnecessary. In the fourth sentence, the “to” goes with the verb see. She wants to see you. She has been in to see you. In the fifth sentence the preposition “into” indicates movement to an interior location. 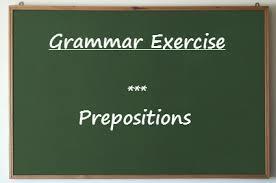 The preposition “in” indicates a position or location. They walked into the broom closet. They are now in the broom closet. Do you see anything wrong in the following sentences? He strongly believed and was devoted to making money. Inside of a dog, it’s too dark to read. Let’s divide the oil between the three western regions. She walked in the room and immediately walked out. Stephen looks no better in a cowboy hat than a beret. The two verbs take different prepositions and both have to be included: He strongly believed in and was devoted to making money. This is the second half of a quip by Groucho Marx: “Outside of a dog, a book is a man’s best friend…” Of is often an unnecessary preposition. The vase fell off (not off of) the table. All (not all of) the students passed. When more than two entities are the recipients of a division, the correct preposition is among. She could walk around in the room, but if we mean she entered the room we have to use the preposition into. Without repeating the preposition “in” before beret, we imply that Stephen looks no better in a cowboy hat than a beret does. You’re not stretching me here, Alan! You have misunderstood my non-prescptivism, Reuben. I reject purists who go apoplectic over usages that have become acceptable in standard English. But there is a standard English with grammar rules that are sometimes broken by folks who are trying to write grammatically correct standard English. I plan to devote some of this blog to such errors. Posts with grammar exercises will be similar to the grammar column I wrote for the Edmonton Journal. And I still teach a grammar and writing class for the U of A Extension.